the last few weeks I have been searching for a few different opportunities and discovered that most trails are dead ends. It has been a test of patience and endurance that has left me absolutely shattered and emotionally drained. This morning at a team meeting, and also a review session, I was in a position where I was supposed to give out a little but the tank was empty…..there was nothing to give. 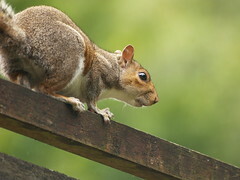 Sometimes I need the endurance of a squirrel on the hunt for food, never ending energy and enthusiasm in abundance.